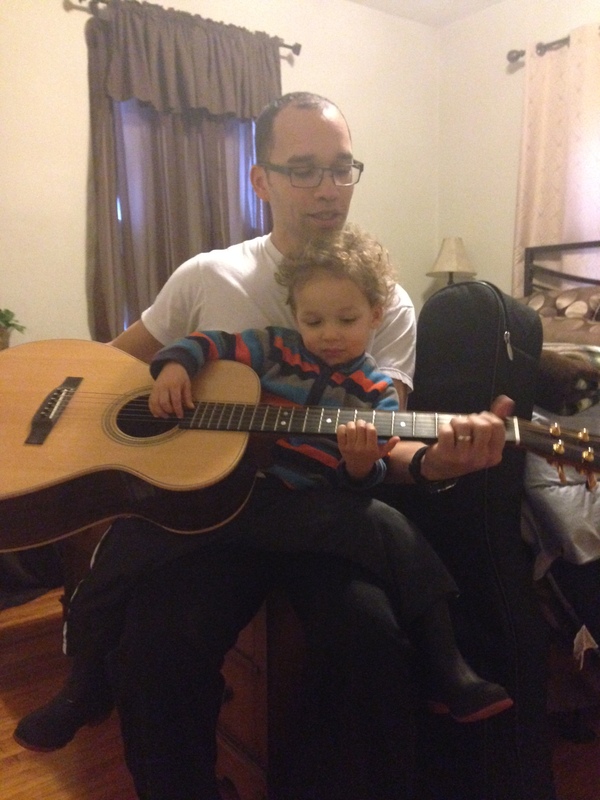 Our only son, Greyson, is learning to play the guitar. He’s two. His name literally means, “Son of the Gray-haired one,” which totally has a double meaning. In one sense, if he keeps wrestling his two big sisters into submission and dumping his food all over the carpet and sweet-talking the ladies like he sweet-talks his mama every day, he’s going to give me gray hairs. On the other hand, even if his antics put me in an early grave, he still has God in heaven, the great, gray-haired Deity who loves him as much as I do, times infinity, right? Now my son is learning follow my lead, putting his fingers where I put mine as I shift to hold the guitar while he plays. Which makes me think of how I must look in God’s eyes, my fingers not quite big enough to get the job done alone, my legs not quite long enough or strong enough. Only God’s tune is not the same “A-D-G-A” that I’m teaching Greyson. It’s slightly more complex than the three simple, prescriptive progressions I am teaching my son. God’s beloved Son, Jesus, says: “Whoever wants to be my disciple must deny themselves and take up their cross and follow me.” As parents, we have a charge to teach our kids the principles of God’s word and show them how to love without completely misrepresenting the message – no small task! To my ears, the invitation sounds like, “Whoever wants to bring me pleasure must deny themselves pleasure.” Which is hard for me to hear, even harder for me to teach my son, and certainly difficult for me to help him unlearn years down the road when I realize that’s not what God meant at all. Just last week, Greyson was doing a puzzle alone and matter-of-factly informed me, “Daddy, it’s Greyson time.” Wouldn’t it be easy if Jesus sent us a text when we needed to stop and spend a moment in prayer? Or if he sent us a golden parchment whenever it was time to read the Bible? Or stop and help someone in need? Or tithe, or show mercy, or [fill in the blank]? The wilderness way is not so easy, yet it is incredibly simple: God invites us to live in the messiness of our discipleship. To know God’s heart, we are invited to spend time with God. To love as God loves, we are counseled by Christ to practice ourselves in the art of loving with selfless abandon, even if our fingers aren’t long enough or our arms don’t quite reach or our hearts aren’t quite big enough. We are invited to “seek first the kingdom of God and God’s righteousness,” which doesn’t mean casting down our nets like Simon and Andrew, James or John, not leaving the accounting table like Matthew. Rather, perhaps it means living in holy wonder and daily pursuit of the awesome call to love God completely and creatively and to love our neighbor first. Denying myself doesn’t always mean not getting my needs met; instead, the opposite is true. God says taking the focus off my needs liberates me to experience the full freedom of God’s blessings. I think following Jesus’ lead is more about character and less about circumstance, more about helping and less about hurting, more about walking with Jesus and less about trying to find his footsteps. 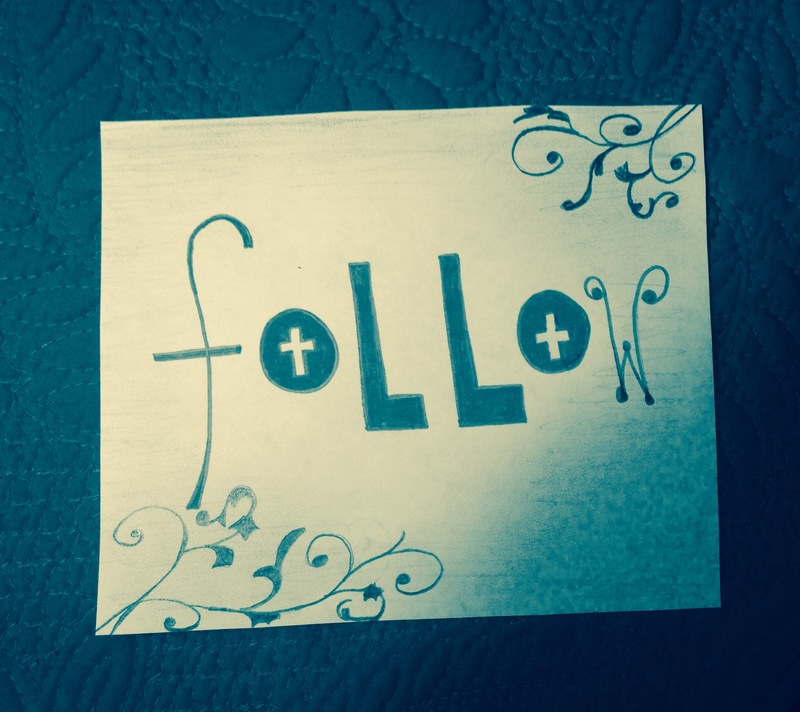 – What does it mean to ‘follow’ Jesus? – What is one way I can deny myself this week? – Why is it so tough to say no to self and follow Jesus? Choose one ‘way to follow’ this week, and then talk about it with your family next Sunday afternoon. As a family, sing “Wherever He Leads I’ll Go,” together. Wherever He leads I’ll go. Cut out a cross from an 8 ½” x 11” piece of paper. Make one per family member. Write, “Deny yourself and take up your cross and follow me,” as many times as possible around the edge. Each person can write his/her name in the center, then fill in the empty space with ways he or she can “take up his cross.” Younger children can decorate the empty space. Joe and Shelby Greemore are parents to Corbany, Addy, and Greyson. Joe pastors the First Baptist Church of Waterloo, Iowa. Tags: cross, deny, discipleship, follow. Bookmark the permalink.